Achieving fantastic investment returns is a lot easier than you think. I was out with a couple of friends today when we got talking about investing and the best places for an investor to put his money. One of my friends wants to take a completely hands off approach to investing, so he decided to put his money into a group of low cost index funds. Low cost indexing is a good investment strategy if you’re a passive investor. But, who want’s to be average? Over these past 6 months, the 1500 value investors who signed up for free net net stock ideas have found out just how much better you can do with only a bit more work. I look at net net stock investing in a very similar way to how I look at index investing. The S&P 500 has returned roughly 10% per year on average over the last 60 years. That means, had you put your money into the S&P 500 sometime in the early 1950s, over the course of the next 60 years you would have earned a return that closely approximates 10% per year. A 10% average annual return is pretty good – it’s definitely nothing to turn your nose up on. But, within that group of companies are firms that would have done substantially better, or substantially worse, than the group as a whole in a given year. If the S&P 500 zoomed ahead 15% over a 12 month period, for example, some firms would return 20%, or even 30%, far outpacing the market. On the other hand, other firms would have done significantly worse. During the same year, some firms would have barely advanced at all or even suffered a sizable loss. Those firms, along with the high returning members of the S&P 500 and every other stock in the index, are responsible for producing that 10% yearly average annual return. But, what would happen to your portfolio if you got rid of all the stocks that lost money? What if you could eliminate all of those stocks from the index? Well, your investment returns would inevitably be much higher than the base 10% the S&P 500 racks up. Without losing stocks dragging down the index, your positive returning stocks would be free to propel the index to some pretty spectacular returns. Of course, you’re right to think that it’s impossible to eliminate all of the losing stocks from a portfolio, never mind the S&P 500. Even Warren Buffett, the greatest investor ever, had his share of losers. You just can’t tell what the future holds, so some stocks will inevitably disappoint. On the other hand, you can definitely reduce a lot of the money-losing stocks from your portfolio. If you were able to do this, your returns would skyrocket. It’s no secret that Benjamin Graham’s famous net net stocks are huge outperformers – that’s why so many people have signed up to get free net net stock ideas each month. Graham’s net net stocks are by far the easiest way to achieve 20-35% annual returns over the long run. But, some net net stocks do far better than others. Ultimately, some net net stocks will only increase moderately during your holding period, or go bankrupt soon after you buy them, such as Albemarle & Bond. And some stocks will linger about near your purchase price, never making a decent return. It’s the combination of these money-losing stocks, along with the net net stocks that yield explosive returns in any given year that create the strategy’s fantastic track record. But what if you could weed a lot of those money-losing net nets out of your portfolio? Well, just as in the case of refining the S&P 500, you would be left with a portfolio of stocks that outperform net nets in general –boosting your strategy’s return by a staggering amount. The catch, of course, is being able to determine in advance which characteristics are likely to lead to underperformance and losses. When it comes to net net stock investing, a lot of this work has already been done. There’s a growing body of scholarly work that has identified numerous characteristics associated with outperformance. Take debt, for instance. While net net stocks do great as a group, stocks with debt to equity ratios greater than 25% tend to lag their peers. Therefore, selecting NCAV stocks with debt to equity ratios of less than 25% will avoid stocks lagging due to debt and produce a portfolio that is highly likely to outperform net net stocks as a whole. Get more tips and investing strategies in your inbox. I’ll send you 9 FREE Investing Spreadsheets as a welcome bonus. It’s not difficult to see why that is. One of the most common ways for a net net stock to advance in price is to be acquired by another firm. This happens to roughly 1/3 to ¼ of all net net stocks I buy. Obviously, all else being equal, a firm with no debt is a much more desirable acquisition candidate than a firm with a 50 or 60% debt to equity ratio. That means that firms with little to no debt will be acquired more often than firms with a significant amount of debt on their balance sheet. But there’s another bonus here – firms that have no debt can’t go bankrupt. This is a valuable nugget of knowledge to have when you’re buying deeply troubled firms, such as the ones that trade below their net current asset value. The consequence of one of your companies going belly up is huge. It can wipe away nearly your entire yearly return. If you can avoid these bankruptcy candidates before they find your way into your portfolio then you’ll rack up far larger long-term results. A second way of avoiding less desirable net net stock candidates is to look for companies with managers who are actively purchasing stock, or using company money to buy back the company’s own stock in order to reduce the share count. Firms with either of these two characteristics have been shown to do extraordinarily well over the long term. Buybacks and insider buys have a special meaning attached to them when it comes to deep value investments. Management is in the best position to know how the company is going to do during the near term, or even over the next few years. Now tell me, which management team in its right mind would buy stock in a company that is on the verge of collapse? In fact, insider buys and share buybacks are a very good indicator that management thinks the company can survive and a much brighter future is in store for the stock. In other words, if management is buying then they think that their stock is a good bet. Company buybacks also hint at the actual health of the business. Which management team would spend money on share repurchases if they saw a looming cash crunch? If black clouds are on the horizon, the thing to do is to conserve cash by cutting back on expenses in as many areas as possible. Dividends and other types of rewards to shareholders take a backseat to the survival and health of the company. On the other hand, if management is busy using the company’s own cash to buy back its own shares then you can be reasonably assured that the company is not about to go bankrupt, has cash to spare, and that management sees buybacks as a great way to take advantage of temporary mispricing. Boosting your investment returns is a lot easier than you realize. 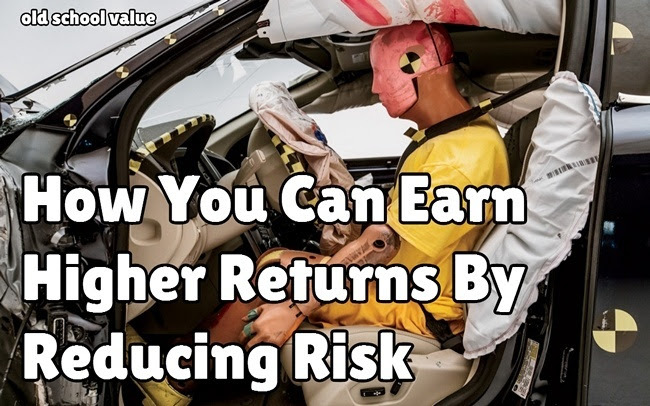 By seeking out firms with characteristics that have been associated with safety and outperformance, you can avoid most of the money-losing stocks you would otherwise stuff into your portfolio, achieving anywhere from 5 to 10% higher yearly returns than you otherwise would have earned. Of course, if you’re interested in growing your savings by leaps and bounds using a time tested high performance strategy then you should definitely take a deep look into adopting Benjamin Graham’s famous net net stocks strategy. So tell me, how do you reduce risk? Don’t forget to sign up for your free net net stock ideas. Click here.